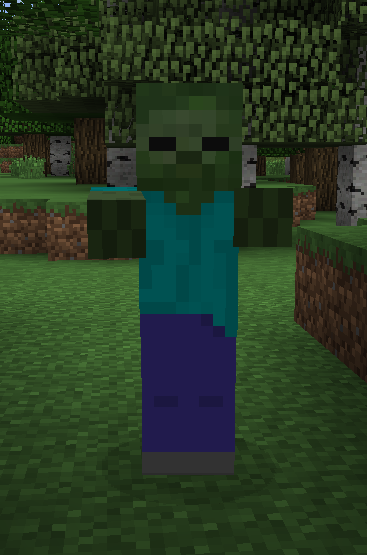 Zombies are hostile Mobs that are the most common enemy mob in the Overworld. They will target any player near them and will walk up to the player and hit them with melee attacks. They are one of the easiest mobs to kill because they move slowly and do not have any range moves. A zombie will drop up to 2 pieces of Rotten Flesh and 5 experience points. They will only spawn in places like caves or during the night and if hit by direct sunlight will catch on fire like a Skeleton. If it is raining or their is shade, the zombie will stop burning.